I do not know much about this branch of poetry. With that, the verse that you posted is impressive. This looks to be a very worthwhile and enjoyable anthology. The history and culture behind this art form also seems so very interesting. This book is a real delight, Brian, and will certainly go on my best-of list for 2017 (even though the year's just starting). The troubadours left a mark in the Portuguese language: words like alba, sirvente, tenso refer to genres in our medieval poetry. I liked Marcabru's view of himself as a channeler; some contemporary poets still share it; Jane Hirshfield talks about it in "Nine Gates". I'm not surprised that some of those terms show up in Portuguese. Though most of the troubadours in the collection hail from the south of France, others are from Italy and around the Iberian peninsula, a kind of Pan-Southwestern Europe phenomenon. The poet as channeler concept is just one of the elements in this collection that appears to belong to both contemporary and ancient traditions ("Sing in me, Muse, and through me tell the story / of that man skilled in all ways of contending..."). What a joy this book turned out to be. 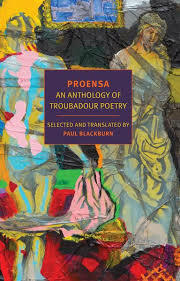 "Blackburn attributed his initial interest in Provençal to his frustration over not understanding the snatches of it that he came across in Pound’s Cantos." Ha ha ha ha! Almost the best reason to translate. That's great. I can't find it, but I read elsewhere something to the effect of Blackburn having out-Pounded Pound with regard to these translations, which is not insignificant since the Pound translations I've read are certainly worth seeking out on their own. I've had a look at some of Blackburn's own incredibly diverse and prolific poetry - a real poet's poet, to use a most unpoetic phrase.